This August get 10% off all DPA Microphones Slim mics – both d:screet™ 4060 and 4061 Slim Lavalier mics and d:fine Slim omnidirectional and directional Headset mics of all colours and variations. 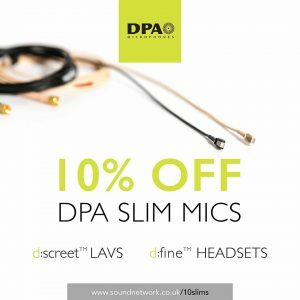 10% off Which DPA Slim Mics? This offer is available from all authorised DPA Microphones dealers in the UK and Ireland, until the 31st of August 2017. Simply call your local DPA dealer and ask for 10% off DPA Slim mics! If you have any further questions please contact us on +44 (0)20 3008 7530 or email [email protected].